Sometimes, you need to restart eWay-CRM web service to make changes functional right away. The article shows you how to restart eWay-CRM web service in different ways. In the main folder of the eWay-CRM web service, there is the Web.config file. For restarting web service, open the file for edit, make a minor change (e.g. put a blank space next to commented text) and save the file. In the main folder of the eWay-CRM web service, there is the _App_Offline.htm file. For restarting web service, rename the file to App_Offline.htm and then back to _App_Offline.htm. Run Internet Information Services (IIS) Manager on the server. Go to Application Pools of your server. 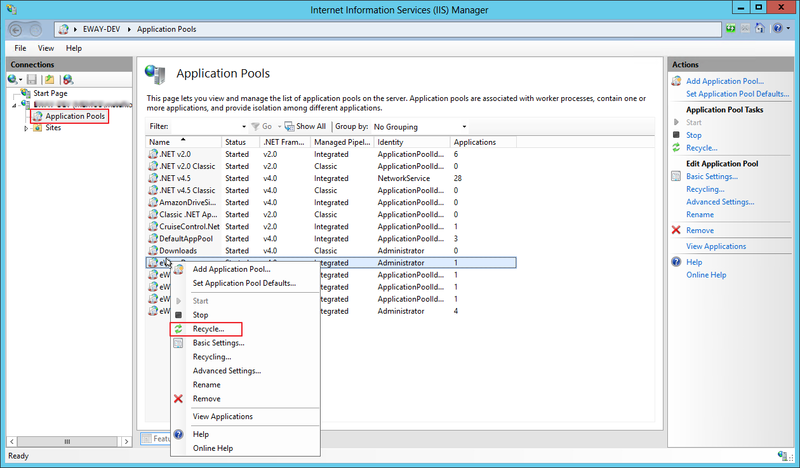 Select application pool of web service that you want to restart and right-click it. Choose Recycle.